A Royal Wedding and No Wedding Band for the Groom? Congratulations are in order for Prince William and Kate Middleton after their lovely wedding in London earlier today. The ceremony was beautiful and so was Kate’s wedding ring, but we’ve heard Prince William won’t be wearing a wedding band? Seems to us he hasn’t heard of tungsten wedding bands, or he’d be wearing something like the BISMARCK, an 8-stone platinum inlay diamond tungsten wedding band. 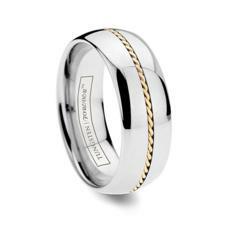 A wedding band durable enough for everyday wear and stylishly fit for a king. Or a prince! Save on Tungsten Rings, Tungsten Wedding Bands and All Tungsten Jewelry This Easter Weekend with Tungsten World! Wishing you and your family a very Happy Easter this weekend! We have great deals on Tungsten Forever‚Ñ¢tungsten rings, tungsten wedding bands and all our tungsten jewelry. And don’t forget to enter our Easter Promo Code: TF35 to save $35 on your order this weekend. 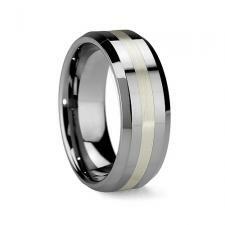 Inlay Tungsten Rings:How a Tungsten Ring Becomes an Inlay Tungsten Ring. Whether it’s the BISMARCK 8-stone platinum inlay diamond tungsten band, the APOLLO polished gold round tungsten carbide ring or the POSEIDON platinum tungsten carbide ring with beveled edge, each inlay tungsten ring starts as a simple, solid style tungsten ring before it becomes the splendid example of craftsmanship you see before you. And now you’ll know just how it’s done! 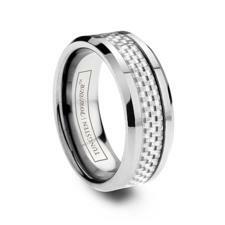 The pinnacle of the Tungsten Forever‚Ñ¢ line of tungsten wedding bands and tungsten rings, the BISMARCK is an 8-stone platinum inlay tungsten diamond wedding band pairing the elegance of diamond and platinum inlay with the strength and craftsmanship of tungsten carbide. 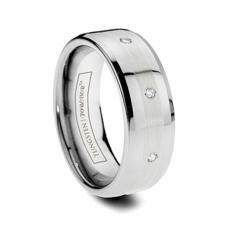 It’s the ultimate designer tungsten wedding band for everyday wear. The BISMARCK is available in both 6mm and 8mm widths. With choice of widths, this elegant tungsten diamond wedding band makes the perfect matching wedding ring set for both men and women. Also, the 950 platinum inlay remains 3mm wide in both 6mm and 8mm widths of the ring. The BISMARCK is fitted with a 3mm wide inlay of 950 Platinum. This wide inlay is used in both width selections, so even if you decide on a 6mm wide band, you’ll still get the same amount of platinum used for your inlay. We only use the highest quality inlays for our inlay tungsten rings and tungsten diamond rings. The BISMARCK’s platinum inlay is completed with 950 Platinum. This high-quality platinum alloy is 950 parts pure platinum per 1000 parts; while pure platinum can be too soft for every day wear, Platinum 950 is the perfect density. The BISMARCK features 8 round-cut diamonds totaling .32 ctw. These high quality stones are expertly set into the 3mm platinum inlay by our manufacturer’s in-house stone setter. The colorless stones are rated as SI I-II quality and G to H in color, making them highly sought after diamonds. Like all of the tungsten rings shown on the site, the BISMARCK is able to be personalized with your laser-engraved message. And as an added bonus, the BISMARCK is one of the many rings on the Tungsten World site that qualifies for free engraving. When shopping at Tungsten World for our Tungsten Forever‚Ñ¢brand, you are guaranteed the highest-quality designer Tungsten Wedding Bands. Every purchase includes our Lifetime Warranty, Lifetime Sizing, 45-day return policy, free 2-day shipping, free wood box + gift bag, and laser engraving is available. In addition, all of our rings are Comfort-Fit and we offer tungsten wedding ring sets. Tungsten World’s Women’s & Men’s Tungsten Rings are offered in a variety of styles and finishes with standard widths in 8mm and 6mm. Tungsten carbide rings are perfect for wedding bands, tungsten engagement rings, or luxury-style tungsten jewelry. Rest assured, when you buy a tungsten wedding band from Tungsten World, you are making a purchase from the most reputable tungsten retailer on the web with best customer service around. Feel free to email or call us if you have any questions, or if there is anything we can do for you. The Season is Upon Us! 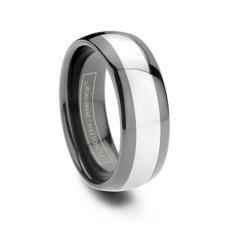 Have You Ordered Your Tungsten Wedding Band, Yet? The weather is warming up and so are we. The wedding season is upon us, and we can’t stop thinking of all the wonderful weddings our Tungsten Forever‚Ñ¢tungsten wedding bands and women’s/men’s tungsten rings will be a part of this year. Whether its a tungsten diamond ring or a matching set of tungsten wedding bands you and your loved one are looking for, with so many tungsten rings to choose from, you’re bound to find the perfect ring for your upcoming wedding. And it looks like our 8-stone platinum inlay diamond tungsten wedding band, the BISMARCK, is going to be the big trend this wedding season. So, have a look at our huge tungsten wedding band selection, and we look forward to assisting you on your big day this season!